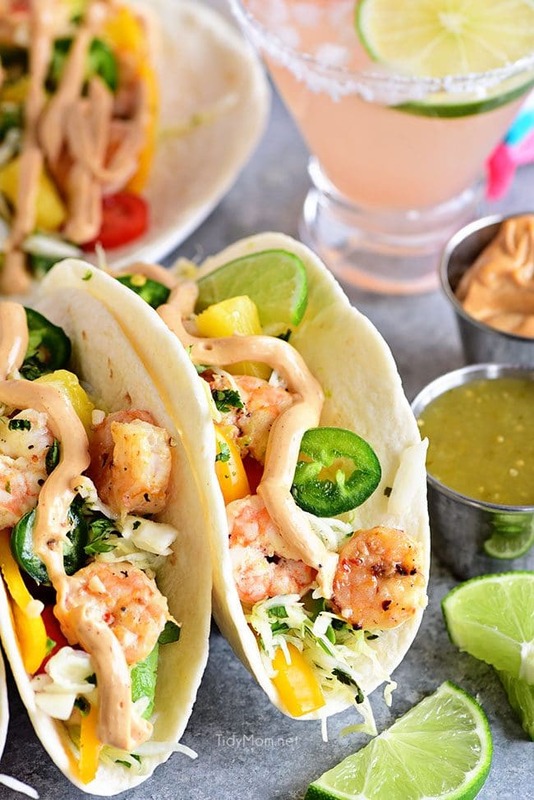 Pineapple lime slaw adds a nice tangy crunch to these Baja Shrimp Tacos. 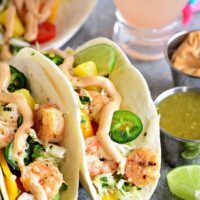 Loaded with garlic roasted shrimp, avocado, sweet peppers, tomatoes and spicy chipotle mayo making these the BEST shrimp tacos. The perfect quick and delicious meal any night of the week. Stop what you’re doing right now, because I’m, about to give you something to taco bout. Not sorry at all about starting this out with the cheesiest of all puns because this recipe really is something to talk about! 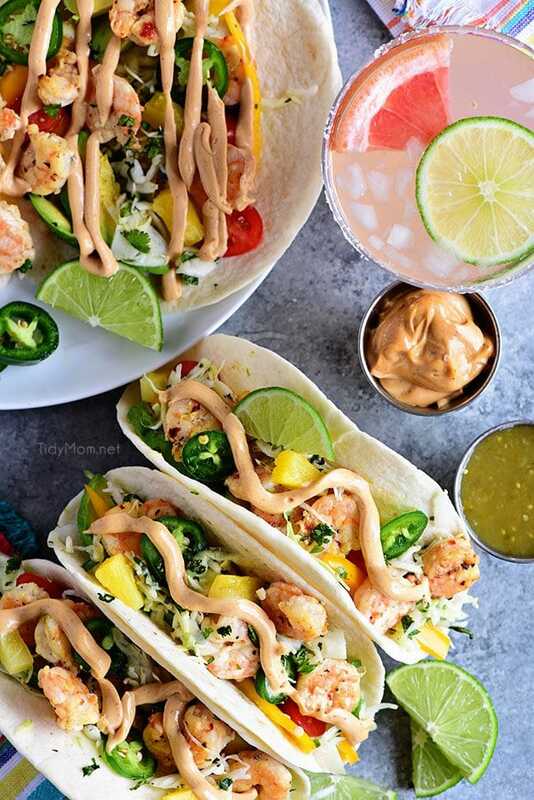 No need to go all the way to your favorite taco joint anymore, because these Baja shrimp tacos are all you need in your taco life! So many unique flavors come together in one flour tortilla to create flavor heaven. From the homemade slaw and chipotle mayo to the baked shrimp and spicy jalapenos, you’ll get something new in each bite. Not only is this a professional quality taco, but its also incredibly easy! Don’t let all the steps fool you, these shrimp tacos are easy enough for even the more inexperienced cooks. What’s In A Baja Shrimp Taco? These tacos have some key ingredients that really makes them stand out from your everyday run of the mill tacos. Now be reminded that these are far from your traditional authentic Mexican tacos. This is more of a California style taco with some new age fresh and fun ingredients. Of course, with tacos, you can really add or subtract anything you want from the ingredient list. It’s the perfect recipe to really make your own and play with. I highly suggest not leaving out the slaw or the chipotle mayo though. Even if you think you might not like it, just give it a try. Both components really make this recipe so amazing! 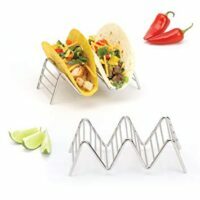 How To Cook Shrimp For Tacos? Cooking shrimp for tacos can be done in various ways, grilled, fried, boiled, or my personal favorite, roasted. For these shrimp tacos, I used my all-time favorite Garlic Roasted Shrimp recipe. I love this way of cooking shrimp because you simply just take your thawed, shelled, and deveined shrimp, toss in the coating and throw it in the oven until fully cooked. I love cooking with shrimp because of its a great healthy convenience food. 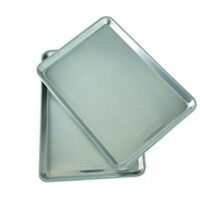 Not only is it something you can buy frozen and quickly defrost, but its also super quick to cook, taking only a few minutes. It’s also great for those trying to watch what they eat with only 84 calories 20 grams of protein, very little fat. With all of those facts, what’s not to love about shrimp! 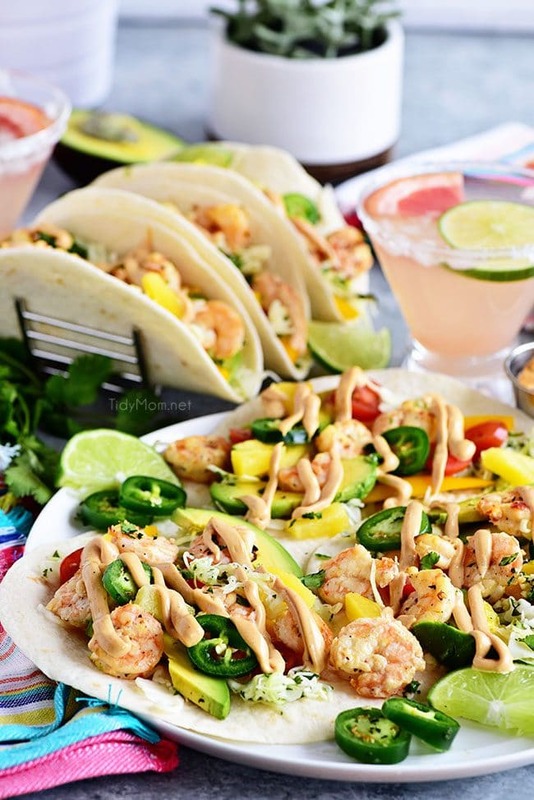 Shrimp Tacos are the Perfect Party Food! With warmer temps coming, we all know that means lots of weekend backyard parties. The hardest part of entertaining can often be figuring out the right spread to make everyone happy. 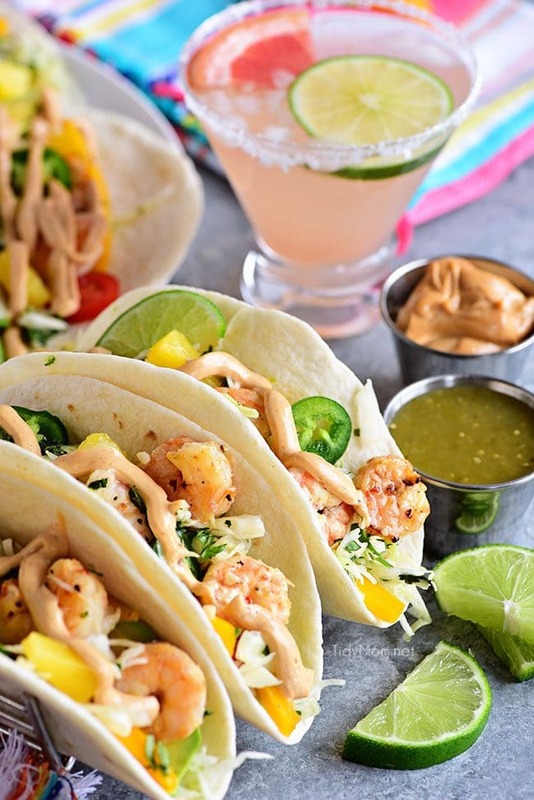 For your next party choose a Mexican theme and make this shrimp taco recipe into a taco bar! Just lay out all the pre-prepared ingredients into separate bowls and let everyone create their own masterpiece. 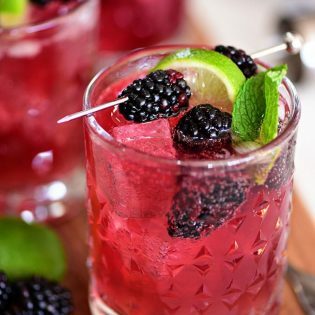 To complement the taco bar check out some of my favorite Mexican themed drinks, sides, and desserts. Southwest Chicken Quesadilla Salad Packed with flavor and texture. It’s like an explosion in your mouth. It’s also super easy to throw together, great for busy weeknights or lunch. Crock Pot Mexican Casserole protein-packed with quinoa, black beans, and ground chicken or turkey. This Mexican casserole is healthy, gluten-free comfort food, and one of the best recipes for Taco Tuesdays or Cinco de Mayo! Taco Pizza Refrigerated pizza crust and pre-cooked chicken makes this taco pizza easy as can be. Add your favorite taco toppings, and don’t forget the crushed Doritos for unexpected crunch and bold flavor. Rio Grande Chicken Quesadilla Taco seasoned chicken and refried beans make up the filling in this quesadilla recipe that is family friendly and filling. Easy Chicken and Cheese Enchiladas Who doesn’t love a quick meal? Typically, enchiladas are quite the chore to make. These enchiladas are oven ready in 15 minutes and on the table in another 30 minutes. Fast and full of flavor! Baked Chipotle Chicken Taquitos Filled with chicken, beans, cheese, and a spicy tomatillo avocado salsa. Baked and not fried, these crispy taquitos are the perfect weekday dinner. 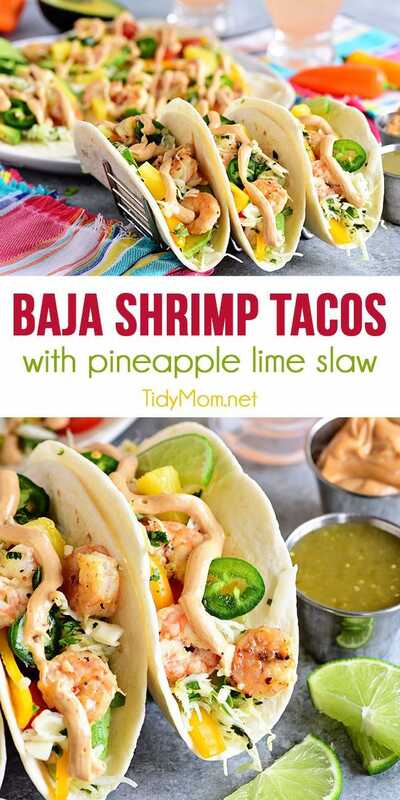 Like This Baja Shrimp Taco Recipe? Pin It! Make It Taco Tuesday Every Day! Who says tacos only get one day of the week? If it were up to me every day would be a Baja shrimp taco day because they are just that good! 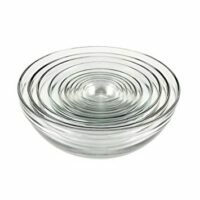 If you’re looking for a simple, yet unique dish that everyone will love, then look no further. 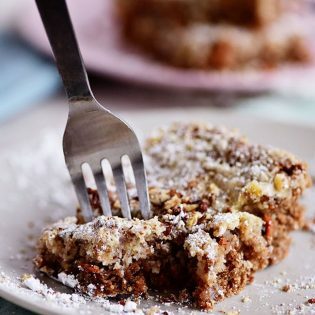 This recipe is a sure-fire crowd pleaser! Prepare garlic roasted shrimp per recipe directions here. Warm the tortillas for 10-15 seconds in the microwave. 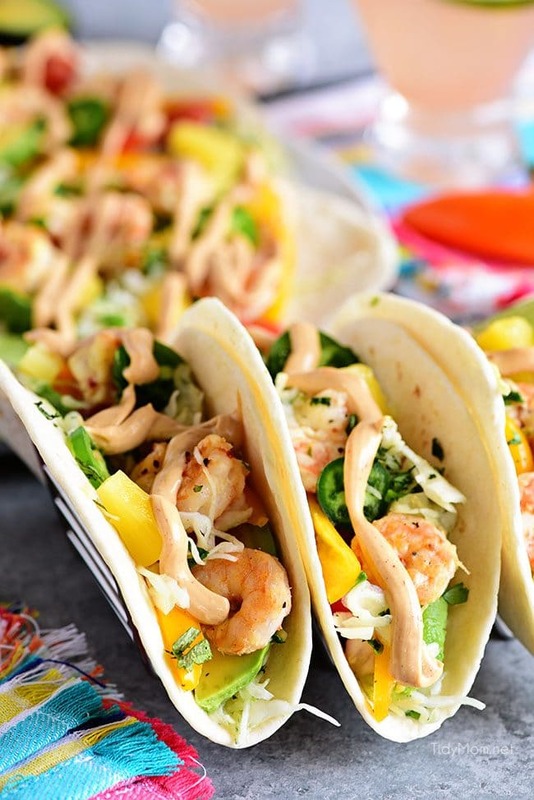 Assemble tacos by adding slaw, avocado, peppers, tomatoes and shrimp to tortillas. Serve with chipotle mayo and tomatillo sauce and if desired. Enjoy! These were SO good!! So much flavor! These tacos are bursting with flavor – just like my favorite fish taco joint! These are just like the tacos I would order growing up at my favorite taco stand. Soooo delicious! 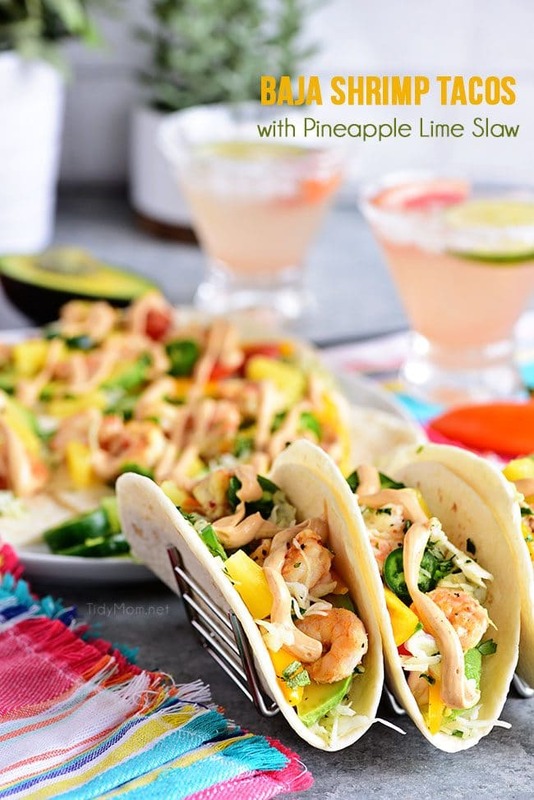 That Pineapple Coleslaw sounds so amazing and love shrimp tacos!!! So much flavor.